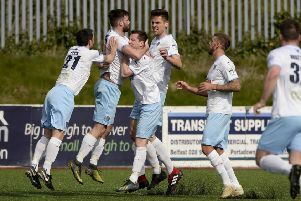 Glenn Ferguson wants his Ballymena United players to carry on their winning form in their remaining two games of the season. A run of four straight league wins has seen the Sky Blues leap-frog Coleraine and one point from the last two home games - against Ballinamallard this Saturday (3pm) and then Dungannon on the final day - is likely to secure a seventh place finish, with a win from either fixture guaranteeing United will finish top of the bottom half of the table. Ballymena United skipper Allan Jenkins escapes the clutches of former United striker Davitt Walsh during Saturday's win at Institute. Picture: Press Eye. “It’s important to keep the momentum going,” said Ferguson after Saturday’s 2-1 win at Institute. “We weren’t just going to give in and see the last six games out. “First and foremost, we weren’t clear of relegation, no matter what anyone said - we wanted to make sure we got that sorted. “Our aim has always been to get as far up the table as possible and get as many points as possible. “We have the opportunity to secure seventh place - it wasn’t our ultimate aim at the start of the season but when you can’t reach that target, you aim for the next one. On Saturday’s victory at Drumahoe, Ferguson said: “We deserved to win the game. “We were under a bit of pressure for the last 10 minutes or so without Tim Allen having to make an outstanding save of sorts. “Young Matthew Shevlin came on and in the space of 10 or 12 minutes, he could have had a hat-trick. “On another day he would have put those away - two of them were pretty clear-cut. But his time will come - I think he has a good future ahead of him. “We got the early goal in the second half which settled us a bit. “I thought we did enough to see the game out. We got the goal five minutes before half-time and then unfortunately conceded on the stroke of half-time. “But straight after half-time we put the pressure on and got ourselves back in front and held on,” added Ferguson.